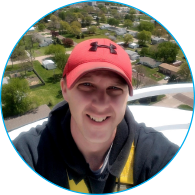 Jeremy Knapp is our operator in the city of North Bend, Nebraska, where he has worked for the past three years and has made a significant impression on the community. “Jeremy wears a lot of hats for North Bend. He is responsible for maintaining the city’s water and wastewater and has the distinction of being North Bend’s fire chief,” said Theresa Busse, North Bend City Administrator. Jeremy is also a licensed EMT for the fire department that provides emergency medical services for the city. “It’s important to me to be an active part of my community. That’s true for most of the PeopleService team,” said Jeremy. As you might expect, being an EMT and fire chief, Jeremy places a high value on safety. “PeopleService emphasizes safety. The company’s safety training program is the most comprehensive I have ever experienced in my work career. We have some busy weeks. We deal with fires and all sorts of other emergencies. You never know what might happen day-to-day, being prepared and ready to take on any situation is what we do,” said Jeremy. Learn more now about the Power of PeopleService.